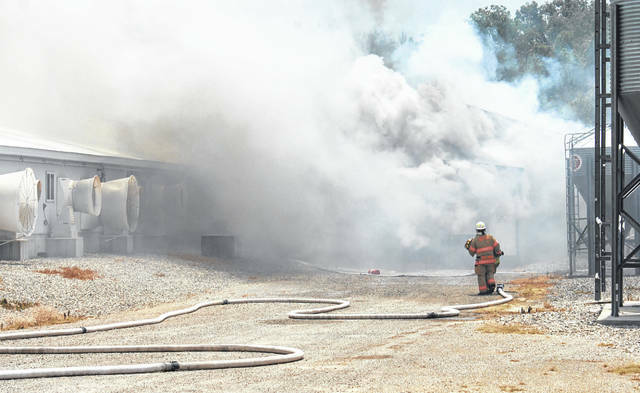 As investigators seek to find the cause of the massive fire that destroyed the Straathof Swine Farm facility in Wayne Township June 19 and killed approximately 5,000 swine, the lengthy clean-up and disposal process at the scene has begun. The cause and the origin of the fire are still under investigation, according to the Ohio Fire Marshal’s Office, and no foul play is suspected. Kelly Stincer, an Ohio Fire Marshal’s Office public information officer, said investigators hope to close the investigation in the next couple of weeks. Throughout the day of the fire, firefighters from five counties battled the blaze at 7111 Old Route 35 Southeast. Along with the Washington and Wayne Township fire departments, firefighters and resources were requested from the Concord-Greene, Bloomingburg-Paint-Marion, Jefferson Township and Pic-A-Fay fire departments. As the fire continued to intensify, additional fire agencies and resources from Highland, Ross, Pickaway and Greene counties were requested to respond and assist with battling the fire and providing water tankers. The Fayette County Emergency Management Agency and Fayette County EMS also responded to the scene. On Friday, Fayette County Commissioner Tony Anderson described the destruction at the scene as “pretty catastrophic,” and asked that Wayne Township residents be patient during the clean-up process. Unfortunately for many Wayne Township residents, there will be an unpleasant odor for some time, Anderson said. The Straathof Swine Farm, which is permitted under the ODA’s Division of Livestock Environmental Permitting, was granted a permit in November of 2011 to expand to a maximum capacity of 5,760 swine, according to documents provided by the ODA. Prior to that time, the farm had less than 2,500 hogs. The last inspection that occurred at Straathof Swine was April 4. Bruce said the facility has never had a violation.